Preheat oven to 450 degrees F. Place beets, parsnips, and fennel in large bowl. Add 2 tablespoons oil, and toss to coat. Season with salt and pepper, if desired, and evenly scatter vegetables on baking sheet. Roast vegetables 20 minutes, turning 2 or 3 times with spatula. Increase oven temperature to 500 degrees F. Roast vegetables 10 minutes more, or until tender. 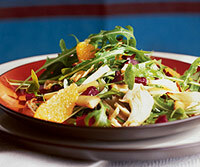 Place arugula, orange slices, and olives in large salad bowl. Add roasted vegetables, balsamic vinegar, and remaining 1 tablespoon oil. Toss well to mix, and season with salt and pepper, if desired. Q&A Wednesday: Do You EVER Indulge?